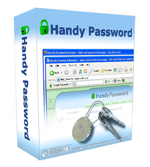 If you're looking for Internet Explorer add-ons, you should take a look at Handy Password. Password manager software is among most useful Internet Explorer add-ons. It works as a browser toolbar. It can save your passwords and next time you enter the site fill them automatically. Variety of features. The password manager features a lot of nice functions, such as saving links to websites, saving and protecting other than web information: PINs, phone numbers, addresses and so on. Handy Password also allows you to auto fill forms and clear them in one single click. Password manager works for Windows 2000/XP/2003/Vista, has a great integration with Mozilla Firefox and is among the most needed Internet Explorer add-ons.